These Tulio Noga shorts I won at an eBay auction in 2005. Seller was pdxmike25, and it was given this description at the auction: Available to you is this form fitting pair of shorts. Made by Tulio Noga and purchased on Fire Island, Shorts are a size large but made from Polyester and Lycra, they fit like a glove. 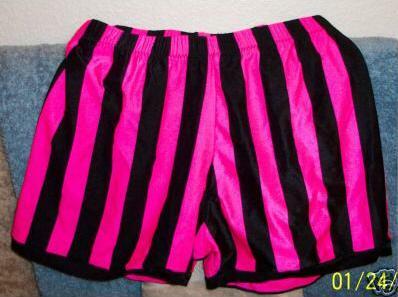 Eye catching black and hot pink stripes makes you get noticed! No inner lining except for in the crotch area-elastic waste band. Perfect for the club goer or the entertainment. I am the original owner. Item was worn once with underwear. Mint Condition. No rips, stains, tears, etc.